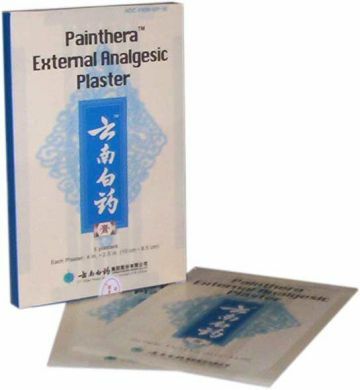 Yunnan Baiyao Plaster is a topical preparation of the formula Yunnan Baiyao, known everywhere in China as the most effective of patent medicines. The story of Yunnan Baiyao and its inventor, Mr. Qu Huangzhang, is frequently told and even has been made into a film. In 1902 Mr. Qu Huanzhang, a practitioner of Chinese medicine who came from Yunnan Province and had set out to explore the entire region and taste its hundreds of herbs, formulated the seemingly magical medicine "Qu Huanzhang Panacea," which is now known as "Yunnan Baiyao (white medicine of Yunnan)". Originally, the powder was utilized topically and internally as a treatment for bleeding wounds to stanch blood flow and speed healing. It soon became known as a multipurpose remedy used more generally to stop bleeding, and also to invigorate blood circulation, speed the elimination of bruises, and remove pustules. It has been used in Chinese medicine as part of the treatment for pulmonary bleeding associated with tuberculosis, gastric and intestinal bleeding, internal cranium bleeding, uterine bleeding, and purpura. As a plaster, it is used mainly for bruises and sprains, but also for backache and arthralgia. Still, its reputation for treating injuries is dominant. In the massive Taierzhuang Battle of 1938 (between Chinese and Japanese forces), Mr. Qu Huanzhang donated more than 30,000 bottles of Yunnan Baiyao to the army, thereby saving the lives of many soldiers. As an indication of its value, it is noted that during the 1940's, army commander Wu Xuexian was seriously injured in his right leg. The French hospital in Kunming (capital of Yunnan) recommended amputation to save Wu's life. Mr. Wu turned to Mr. Qu for help, and to everyone's surprise, recovered without the need for an amputation. Yunnan Baiyao gained the reputation as a miracle remedy. After the death of Mr. Qu, his wife, Liao Lanying, donated the secret prescription to the government. Large-scale production was implemented at that time and continues through to the present, mainly as a product of the Yunnan Baiyao Group.